Gone are the days when executive assistants would take notes, file them in cabinets and fax information between departments. Today, we’re ever connected to our digital and mobile devices, which isn’t necessarily a bad thing in the workplace. More and more can be accomplished through virtual streams, enabling companies to spread out over countries, time zones and continents — still able to effectively communicate and collaborate. Build Company Cultural with Digital: Training employees with virtual materials, like guides and videos, is a great way to show them how important virtual collaboration is to you. Interactive virtual courses and guides will get them in the habit of using the Internet as a means to conduct normal collaboration tasks at work. It’s best that you keep this kind of requirement consistent so as not to confuse your employees. 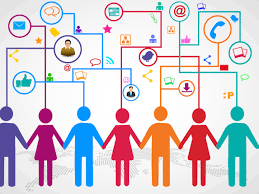 Create Virtual Chat Groups: Humans still require connection throughout the day to be happy. Even if your workforce isn’t physically together all of the time, make sure they understand the chat features and communication channels available to them through your traffic management software. Invest in Education: Many work places are dragging their heals when it comes to the future of centralized traffic management. However, people tend to turn their noses up at things they don’t understand. In order to digitize your workplace, you’re going to have to invest in some form of education to make sure everyone is on the same page. Build Virtual Trust: In order for employees to respect you and respond to you, even if through a digital device, you still need to earn their trust. Sending photos and other snapshots to prove you’re there for them, doing what you are supposed to be doing, etc. will provide them with proof that virtual collaboration isn’t any different than in-person collaboration. Demonstrate the Benefits: Sending weekly newsletters, blogs, videos, and so forth demonstrating the benefits of your centralized traffic management software and virtual components will slowly convince your employees that it’s best for them. Touching on the increased efficiency and connectivity to the client, available digital tools, and quick communication will showcase to your employees that they’re working in the best kind of environment today. Our workflow management software enables you to connect with people and teams across the world, all at once, minimizing any communication or collaboration problems. By introducing this concept to your employees in an educational manner, they’ll come to see how valuable a personal virtual assistant can be in their lives. Have you Submitted your Time Sheet yet? You’d make a great Traffic Manager!